The Insurance Accounting and Systems Association (IASA) is a non-profit education association with over a thousand member companies. Among the attractions to their annual event are the world class speakers. This year the event boasted two highly coveted keynote speakers who shared their personal stories on leadership. They were Super Bowl winning quarterback and five-time NFL MVP, Peyton Manning, and former Secretary of State, Condoleeza Rice. Code Objects is a California based developer of software for the insurance industry. Their annual conference is comprised of over 90 technical sessions. Trade show attendees also had the opportunity to learn about the latest accounting and IT products and services for the insurance industry from over 200 exhibitors. Multiple companies at the exhibition chose to Nomadic for their trade show exhibits including industry luminaries Code Objects, Majesco and Brovada Technologies. Brovada Technologies offers a platform for integrating multiple insurance systems and portals. Whether you wish to purchase or rent your next trade show display, you can depend on Nomadic Display to design and deliver an environment tailored to your needs. Check out our searchable database of designs and contact us today for a design and quote. Many companies today are reaching beyond their native borders to develop new business opportunities. Whether the goal is to build a global brand, increase revenue, expand distribution, or establish operations, trade shows are one of the best ways to introduce your company to a new market. The following key points should be beneficial to exploring international trade shows. Find the right event. There are a number of searchable trade show directories online that enable you to research trade shows by country, industry, search term, and dates. Examples include M&A or Expobase. 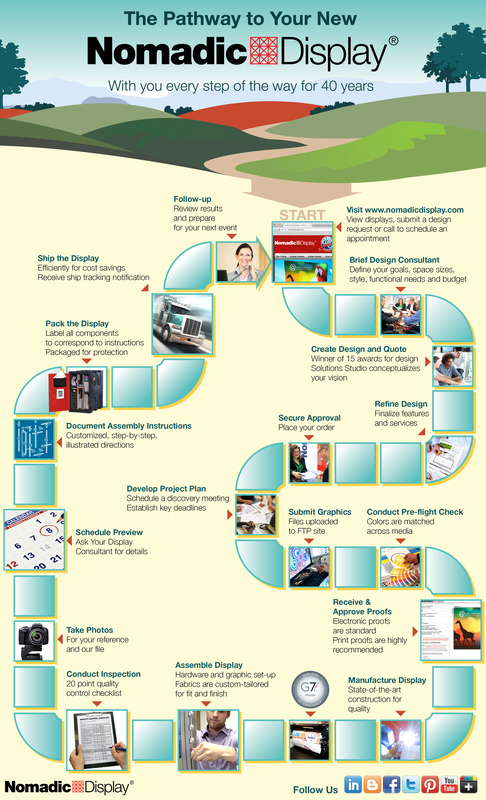 Your exhibit house should be able to help you screen appropriate trade shows based on your specific goals. Do your research. Learn as much as you can about international exhibiting in general and specifically in your target markets. Exhibitor Magazine publishes an annual article on top trade show destinations. The ExhibitorLive conference offers a number of international education sessions. Mark your calendar to attend Feb 29-Mar 2, 2016 and register here to receive conference updates. Select an experienced partner. You will want to work with an organization that has experience in your target market. Ideally the organization you choose will have operations located in your target market. Nomadic Display has offices in major markets in the US and Europe that offer display fabrication, exhibit rentals, graphics, and show services. We produce from the location closest to our clients’ exhibition destination to reduce time and expense. If you plan to work with an independent consultant, be sure to ask for client references to verify their experience. Design for a different audience. 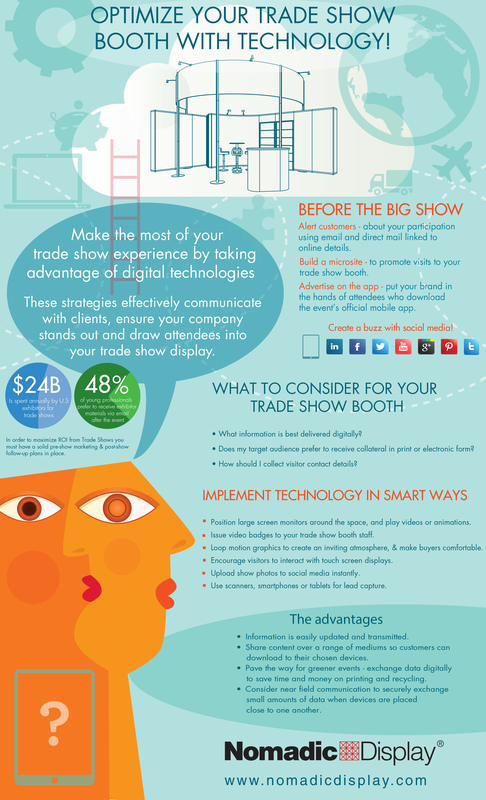 Your trade show display needs to engage an audience of a different culture. That requires an understanding of the style, colors, language, in-booth activities, and more that will drive the optimal trade show display design. To effectively collaborate at your exhibit design kick off meeting bring show specific regulations, a floor plan denoting your space on it and a design brief that includes your research into your target market. For more tips on international exhibiting, go to Resources. Tags: trade show, trade show display, trade show display design, exhibition, exhibit design, international exhibiting.